Why bottle in glass instead of plastic? 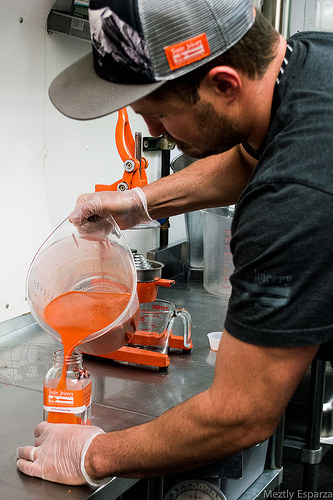 It all comes down to keeping our cold pressed, organic products as pure as the local produce they're made from. Here's a breakdown on why we make sure every ounce of Tonic Juicery juice goes straight into glass and never touches chemical-leeching plastics. Chemicals used to manufacture and treat plastics remain on new plastic bottles at the time of bottling. These chemicals (including classic offenders like PET and BPA) are part of what contribute to that tangy smell plastic imparts onto juices stored in it. Similar reasons that make plastic have a smell also contribute to the funky taste plastic leaches into liquids. Plastic leaches harmful chemicals into liquids stored in it. Glass does not leach harmful chemicals because there simply aren't any chemicals to leach. Glass's lack of chemical properties and chemical residue of glass is one of the biggest reasons scientific lab equipment is made of glass. The glass does not contaminate pure elements with any property altering chemicals. Plastics are manufactured from petrochemicals synthesised from other chemicals, combined with other chemicals, mixed up in a lab with even more chemicals, and then treated and dyed with, you guessed it, chemicals. Not to mention all the while emitting toxic chemical byproducts into our atmosphere and hurting our beautiful planet. Glass is made from sand, one of the most abundant natural resources on our beautiful planet. Plastic bottles usually get used once and thrown away or recycled because their structural integrity degrades over time. Minerals like Himalayan Pink Salt in our juice also react with the chemicals in plastic. This causes the chemical bonds to break down and leave a lingering smell. Because glass is non-reactive, glass bottles can be used over and over and over again without losing their structural integrity. These reasons are why wines are stored and aged in glass bottles. It's also why we offer a glass bottle return program! All you need to do is wash your Tonic Juicery bottles after using them and bring them back to the store. We take care of the rest. So why are so many companies still bottling in plastic? Plastic is not as brittle as glass and does not break as easily as glass does. In case you're interested, here are a few companies who bottle their beverages in plastic. Many of these brands can be found at Whole Foods and other similar health food markets. They include Blue Print + Cru + Trader Joes + Boathouse Farms + Odwalla + Naked + Clover + Evolution + Suja. Any others you think we should know about? Let us know in the comments!